Why volunteer at HIP versus other organizations? Work Opps and HIP have been working together for over seven years. I think the relationship between both organizations works so well because at the core of it all, our missions share a common ground. I think the idea of empowering through nutrition goes hand in hand with promoting self-determination, self-respect and valued participation in the community for persons with disabilities. What do you do as a HIP volunteer? 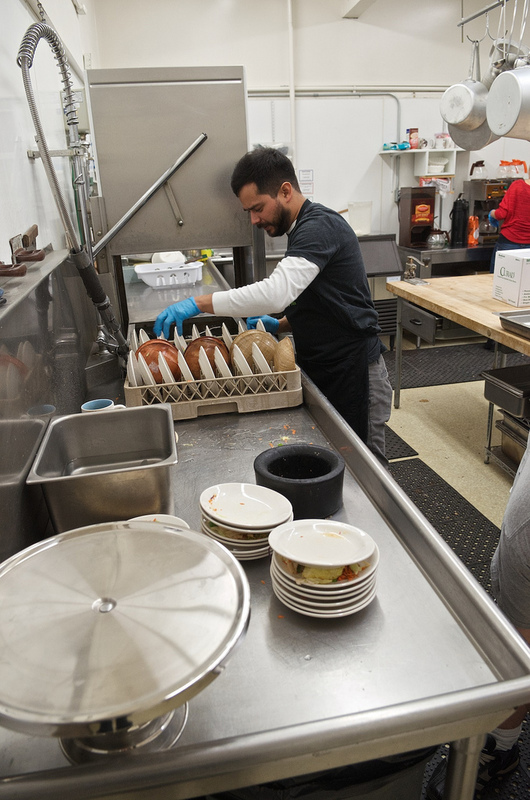 Every Monday, I Job Coach Jason who is part of the kitchen and clean-up team for HIP’s Senior Community Meals program at the Lake City Community Center. One of Jason’s primary goals is to gain paid employment as a dishwasher. Senior Community Meals provides me with the tools and the environment to assist Jason in pursuing his goals, through direct, hands on, education. What drew you to volunteer with HIP? Honestly, the great partnership HIP has with Work Opps. Whether it was passing out lunches at the North Helpline Food Bank or assisting in their Summer Meals for Kids, HIP continually provides me and the Work Opps clients I represent with a chance to build upon our core values, through valued, meaningful participation. The whole HIP family. Amazing people doing amazing things. Seriously. Such a great cast. How are you able to use your talents in your volunteering? HIP is constantly providing me with the tools to teach and build skills in my clients desired field of employment. For Jason, we get to be involved in a program that not only provides us with a free lunch and an unlimited amount of coffee, but let’s us build skills directly. What do you enjoy the most about volunteering with HIP? When somewhere between a kitchen teetering on the brink of chaos and what appears to be an endless sea of dirty dishes, Jason and I, get the time to take a quick coffee break to soak it all in. Hard work is hard work but no one said it doesn’t have to be fun either.